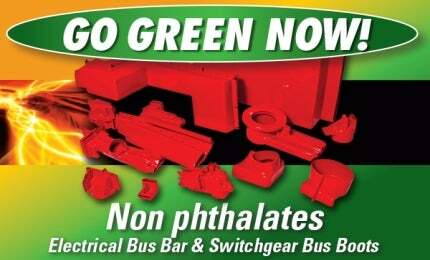 Eger Products manufactures bus boots for switchgear and bus bar insulation and is a leader in non phthalates. Its services are an economical alternative to taping and are recognised for using environmentally safe products. The company’s electrical grade, UL listed, red or black plastisol is used to manufacture bus boots, switchgear insulation and bus bar insulation. This material is suitable for applications up to 38kV, with sizes up to 6ft in length, and also has exceptional dielectric properties. Eger has a range of standard-sized bus boots, switchgear insulation, bus bar insulation and bus bar boots, including wildlife and animal outage protectors. Eger Products has more than 275,000ft² of state-of-the-art manufacturing, warehousing and distribution space. Standard products are available for immediate delivery and the company offers custom stocking programmes. Custom sizes are available up to 6ft in length. Moulds are manufactured from an in-house machine shop, which includes the in-house engineering department, CAD design, tool shop, custom mould shop and testing facility. The company stocks more than 50,000 moulds that meet 99% of industry requirements. Eger is an ISO-certified manufacturing firm. None of its products have experienced electrical component field failures in its 30 years, when installed correctly. Eger Products has also earned Underwriters Laboratories (UL) certification. Eger Products has an economical solution to taping in the industry, with thousands of standard-size bus boot and switchgear insulations, ranging from the smallest to the largest in the world. Eger Products provides a free, in-house design service for specific customer needs. The company’s CNC machining centre can ship the first article for inspection within 24 hours of an order for any custom dip-moulded bus boot, switchgear insulation, bus bar boot or bus bar insulation. Eger Products’ animal outage protectors are designed to prevent costly power outages and the electrocution of birds and wildlife. This is a long-term solution to the recurring and expensive problem faced by utility companies and businesses. The outage protectors come in grey or black and are designed for long-term use in extreme weather conditions. Animal outage protection protects birds, squirrels and endangered wildlife and reduces the PUC penalties and fines associated with unscheduled outages. Eger Products offers the highest quality porcelain insulators, transformer and switchgear bushings, which are made of the highest quality porcelain and manufactured under the strictest standards. Porcelain insulators provide years of reliable and consistent performance in the most challenging environments. They are built to withstand corrosive saltwater environments, petrochemical facilities, hot and cold temperatures, as well as seismically active locations. Eger Products stocks dozens of industry-standard sizes that are available for immediate delivery. Eger Products supplies a range of porcelain bushings and bushing assemblies for transformer, switchgear, capacitor (two flute to 14 flute) and special power apparatus applications. These are designed to provide years of maintenance-free service and are durable and reliable. Eger also offers a range of products for low and high-voltage bushing assemblies. High-quality polyester UL recognised standoff insulators, panelboard and switchboard accessories are available. The company’s moulded insulators have greater height tolerances and higher shatter resistance when compared to ceramic insulators. Standoff insulators are moulded from a UL-recognised, flame-resistant fibreglass-reinforced thermoset polyester moulding compound. Moulded insulators have higher heat and moisture resistance properties than regular plastic insulators. Eger Products supplies electrical grade bus boots, switchgear insulation, bus bar insulation and bus bar boots. Eger Products has a complete line of durable and reliable porcelain bushings for transformer, switchgear, capacitor and special power apparatus applications. Eger Products' standoff insulators, panelboard and switchboard accessories are polyester UL certified.